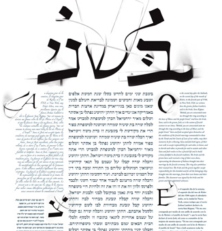 If you’re looking for anything but the standard big-box store Ketubah, Oded Ezer Typography makes incredibly gorgeous Ketubot without ever lifting a paint brush! Using his unique styling and famous type-faces which he creates himself, Oded Ezer blew away both Heidi and myself with his special paper-cutting techniques, far different from anything else we’ve ever seen! Since his work takes is so custom, these Ketubot aren’t open to the general public, and he only works on a commissioned basis. Currently, the website doesn’t feature any way to see his past Ketubah works or submit an order, but a friendly email should do the trick! As an Israeli, we’re sure Oded Ezer navigates Hebrew just as well as English, and his years of experience in creating typeface for all types of artwork nearly guarantees a beautiful work of art whose letters themselves will bind you and your fiance together happily forever!